If it's not a remaster, bold changes can help great old games find new players. My generation is currently having its nostalgia moment. I can listen to podcasts that analyse every Simpsons or Lost episode in granular detail, Twin Peaks came back from the dead because college students my age watched it on Netflix, and developers are remaking games that were released when I was a kid. And if it's not a remake, it's a spiritual successor—the likes of Phoenix Point, Pillars of Eternity and many more revive the types of games we played 20 or so years ago. We've reached the next stage of that with Capcom's Resident Evil 2 remake. It's one of the first times this decade that a big publisher is embarking on a major re-imagining of a classic, and it's far from a remaster, swapping fixed camera angles for a third-person shooter view. The tone, though, seems compellingly grim based on this footage, in a way I think series fans will appreciate even if no longer looks like the same game. If it's a success, I can see it starting a trend of remakes that go way beyond a graphical overhaul. Below, I've collected my thoughts on the factors that face developers in remaking games now, touching upon projects like Pathologic 2, the System Shock remake and Resident Evil 2. Resident Evil 2 did scare me back in the day, partly because I was 11 and easily spooked by the police station's low-lit pre-rendered backgrounds and ambient sounds. I probably wouldn't recommend it to anyone younger than me now for several reasons. The voice-acting is terrible, deliberately or not. The combat has the struggle you want from a horror game, but it's fiddly to control by modern standards. You couldn't really do that style of game now—by Resident Evil 0 on GameCube in 2002, critics were burning out on this formula, and it's ultimately why Resident Evil 4's series revamp happened. 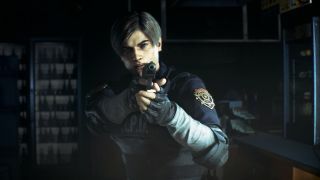 I can't see that style of game getting anyone but Resi fans excited now, and obviously Capcom will want a new generation of players to discover Resident Evil 2. For the remake, it looks like they took the same setting, characters and features and asked what that would look like now if you were to build it from scratch, hewing closer to the tone of Resi 7 than previous entries. I can't wait to get lost in it, and I'd rather this kind of approach than a shiny-looking retread. In Resident Evil 1's GameCube remake (released on PC in 2015), I think about what they did with sharks to make them terrifying. The 1996 original presented them as some pretty basic-looking enemies that swam around hassling the player (footage here). The remake, on the other hand, made them terrifyingly real and Jaws-like, to fit the enhanced realism of the game's visual style. That's a good example of using better graphics technology and a (presumably) bigger budget to subvert player expectation. This thing you thought you knew was now scarier than you'd even imagined it could be. It wasn't exactly the same as it was, but the player's experience of the game was ultimately improved by the shock of such a bold change. It's not always that easy to figure out the right approach to remaking a game, though. I'm not a backer, so I can't say I've followed System Shock's remake much beyond playing the demo released after announcement, which showed promise. But Wes's interview with the team at Nightdive in March brought up some interesting decisions made behind the scenes on that project. "As we geared up and started moving forward with it, we began to run into feature creep," business development director Larry Kuperman said. "All of those things like 'you know what would really be cool, how we might reinterpret this.' Various people wanted to put their imprint on it. As this process evolved over a period of time, it grew in complexity, and it veered away from this original representation. That doesn't mean that interpretation would've been bad, but it wouldn't have been true to the System Shock vision." It's a tricky balance, deciding what to add to a game people love, especially with a game as influential as System Shock. When so many of our favourite classics are available forever on Steam, GOG or wherever, though, I think surprising players is no bad thing as long as it feels like a sensible extension of the original game's vision. Pathologic 2, the confusingly-named remake of the original 2005 first-person horror game, is refining a bunch of elements like its reputation system, as explored here. I can't say it's a game I've played before, but everything Joe relayed about it during his demo back in 2016 makes me think this is the version to pick up, and I'm glad someone is giving that game a chance to reach more people. Joe described it as "smoothing the edges of its source material while retaining the despondent charm that elevated the original to cult status." I'd love to see a ton of influential PC games from 15-25 years ago get that kind of treatment, where it's a better fit for modern tastes but keeps the essential elements of the game people loved. Resident Evil 2 might be a more extreme example of a remake in terms of changes to the design, but not everything needs that level of reinvention. Better controls, UI, cutting content that doesn't work, revamping different systems or adding new difficulty settings might be enough to get a classic in front of a new audience.